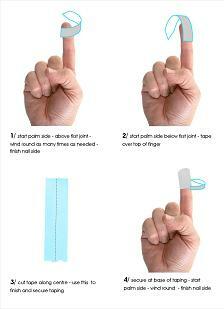 Buy our finger tape to protect your blistered or damaged fingers if you are a double bass player or electric bassist. "Received with thanks Steve, and may I say, what a fine product this is, (the tape saved my fingers from total destruction whilst on tour earlier this year). I can't thank you enough for helping to relieve the pain that was compromising the pleasure of playing. All the best for the future Steve, and I will definitely be buying this product from you again." Don't blister the life out of your seasoned, doghouse fingers - stop playing through the pain and order your double bass finger tape today! If you're a Jazz, Blues, Folk, Bluegrass, Country, Rock n Roll, Rockabilly, Psychobilly or New Orleans Double Bass player this product is for you. It will get you through your gig, your tour or your student exam. We thoroughly recommend and endorse this product. It lasts for hours and protects sore and damaged fingers, nails and fingertips. Also used and recommended by electric bass players. We also strongly recommend this product to keep in your gig bag for an emergency. We have had many inquiries for the price of multiple rolls of this tape. You can buy up to 4 rolls per order for the same UK postage price of £3.00. Postage is slightly high on this product due to the size falling in to the UK Royal Mail parcel rate rather than the letter rate. The largest order we can accept is for 4 rolls. Hi, I'm Steve Tucker. As a long-time double bass player, I've been through the frustration and pain barrier of having overworked and overplayed sore fingers. I spent many years playing acoustically in jazz, folk and rock ‘n’ roll bands where the promoter's requirement was strictly no amplification. I guess this was to replicate the authentic original sound of the era. I made a wooden hollow soundboard to project the sound with a hole for the endpin – it worked very well but I struggled on with callouses, blisters, cracks and cuts on my fingers. I was working on trying to get a big, ballsy tone and sound that would travel. I learnt very quickly the need to dig in, to learn how to develop my slap playing and really pull the sound out of my bass. The hallmark sound I was looking for on the bass was to push for its percussive quality, I wanted a real ballsy tone and volume. The secret of effective DB playing is of course all in the fingers. I started to learn very quickly about blood blisters and building callouses. I would pop them with a needle, drain them and soak them in surgical spirit, alcohol, vinegar - anything I could get my hands on. I even used super glue to get me through a gig. I was quick to realise these solutions were temporary, could cause infections and the liquids could get into my blood stream. I tried using lighter gauge strings, nylon and gut strings and even lowering the action. None of these options gave the sound I was looking for. 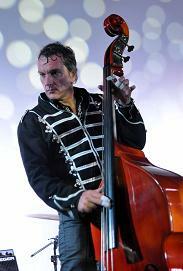 As our gigs got bigger we had to to use amplification but I still wanted that natural sound and tone of the double bass. Turning up the amp to compensate for my bruised and damaged finger tips was an option but I lost the tone and I started to sound like an electric bass player. I then started to experiment with taping my fingers. I tried so many manufacturers, visited so many chemists even discussed my requirement with pharmacists and doctors but they didn't really understand my product problem. They would say stop playing and leave the blisters to heal for a while - no practice - no gigs, but I didn't have that time as I was playing 4/5 times a week with recording sessions in between. I simply didn't have enough recovery time. They explained to me that my finger tips along with my tongue were the most sensitive part of my body and needed protection if I was to continue my dynamic style of playing. They saw no need for me to endure so much pain while I was playing. As musicians we need to take care of our hands. After trying many, many tape products I finally came across a manufacturer of a fantastic product and now here it is, available to you today!